Odell has put a little twist on all those barrel aged imperial beers that are on the market, and it sounds just peachy. Jesus, I am pathetic. 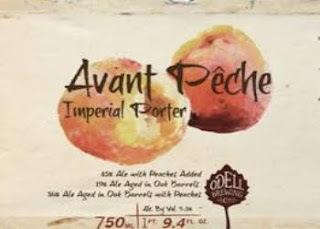 Avant Peche is the expensive sounding name of Odell's Imperial Porter that was oak-aged along with Colorado peaches. The final result is actually a blend that takes an engineering degree to comprehend, or at least deeper study than "Fear of Math", the highest level class I was able to pass: 45% ale w/ peaches added, 19% Ale aged in Oak Barrels and 36% ale aged in Oak barrels w/ peaches added. Got that? Throw in some yeasts gone wild and you get quite the interesting 9.5% concoction- or so I imagine. I haven't tried it yet, though you can get yours at Jubilation for $14.99 and tell me how it is.